Google Docs team regularly rolls out some new interesting features and add-ons. Despite the minimalist nature of the web app, there are tons of tricks that can improve your productivity. Let's take a look at some of the productivity features for this app. 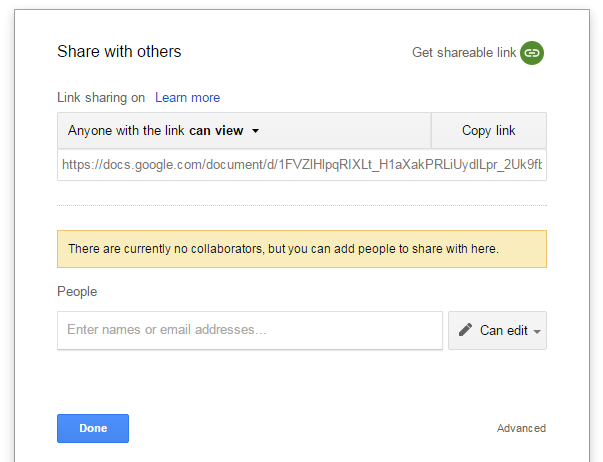 Google docs allow you to share the document. This sharing can be private or public depending on how you set the access level. If you want only specific users to view the document then you can share it privately. If you want everybody to have read only access to the document then you can share it publicly. Click on the top right corner for share button. This should give you an option to share the document link. You can then set the document access level on the dialog box. You can set either Public or Private level for document access. 4. Copy the IFRAME code and paste it into your HTML document. You can also set the option to make the changes live as they occur. This way your embedded document will be up to date with the changes. Google docs allow you to have multiple editors on your document. You can email the document editors for collaboration. You can also see the changes highlighted and you can see who made what change. This way you can also track how many collaborators worked on the document. In order to email the collaborators follow the steps below. Add the collaborators using their Gmail ID. The people who are invited to the collaboration will have the editing access to the document. Google docs allows the document to be exported in multiple format such as - PDF, Word Doc, Text Doc, Open Document and HTML Document. In order to download the document in different file format follow the steps. 2. Select Download file as. 3. Choose - Microsoft Word (.docx), OpenDocument Format (.odt), Rich Text Format (.rtf), Plain Text (.txt) and Web Page (.html, zipped). as an export option. 4. Select Ok to start the export. This should generate the document in the format of your choice. 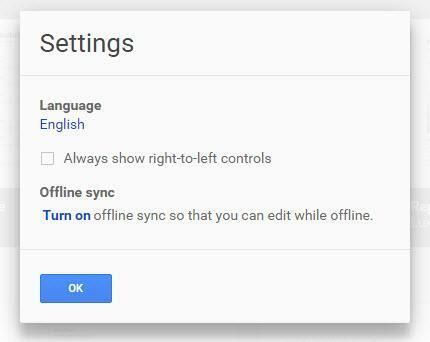 Google Docs can be used offline and you can enable or disable the offline access. In order to enable the offline access you have to go to Google Driver settings. Follow the steps below to enable offline access. 2. Go to settings page. 3. Select checkbox on option "Sync your work to this computer so that you can edit offline". This should enable your document to have offline editing access. Do note that if you clear the cookies and the history then you may not be able to have access to the Google document being saved. Google docs has this feature of installing Add-ons. These add-ons are created to extend the existing functionality of the docs. This way you can easily use the add-ons for effective usage of documents. You can install the add-ons by going to to Tools > Add-ons. The same menu can be used to remove any existing add-ons that you don't want to use anymore. Newly installed Add-ons get added to the menu. For example, say dictionary add-on if added will be found in the menu Tools > Add-ons > Dictionary. There are plenty of interesting add-ons like bibliography creator, diagramming tool, and table of contents generator.You can find more add-ons created by community. If you don't like distractions while writing your book or important business document, then in such case you can enable compact mode. In order to enable this mode, you have to click on CTRL+SHIFT+F shortcut. You can also perform the same action from the top toolbar menu. This mode is handy when you don't want to see the options and other distracting user interface element. You can use the same shortcut to get out of the full-screen mode. You can extend the Google Docs functionality using the Google apps script. There are plenty of scripts from the community members that you can use to extend the current features of Google docs. The script that gets Google translate API for instant translation can be handy. Similar to this script, there are plenty of scripts that you can use for your benefit. You can also design your own script run for personal use or share it with community. You can learn more about Google Apps scripts from Developer center of Google. Google Docs allows you to use Google Translate option inside your document. This way you can translate complete document or some parts of the document. This feature is enabled only with few limited languages as of now. You can use the add-on for translating from additional different languages or translating into other languages. e.g. You can use it to translate the document from Spanish to English and vice versa. It may not be accurate translation but you can get some partial accuracy and later proof read the document. You can use large collection of web fonts from the Docs. This feature allows you to use the web fonts within your document. All you have to do is find the font of your choice and display it inside the document. The font can be also rendered during the document conversion into PDF and Word format. So in such process you are not losing the font consistency. When you select the font from the font drop down, you can click on option "more web fonts". This allows you the access to the additional web fonts on Google. There are plenty of Google Docs tricks that can improve your productivity. With each new Google Apps update the Docs are likely to have more interesting features in it. The above listed tips can help enhance you get the most out of Google Docs experience.